Ceramic, fibre, glass and porcelain—there’s plenty different tableware we’ve all dined in. But remember those white enamel ones your grandparents probably had a stock of? Still wondering what tamchini is? Simply put, tamchini is the Hindi term for enamel ware that was popular in the olden times. Made out of iron or tin, these crockery come covered in white enamel and coloured border (mostly blue) to protect it from corrosion and heat. Plates, bowls, mugs and dishes, tamchini was a readily available in most households at least an era back, until glass, fibre and plastic took over the kitchen scene. Given a little effort, finding regular tamchini won’t be too difficult, but finding them with fine designs and beautiful patterns in the city is no child’s play. These rare gems are found in only one nook of the city tucked inside the bustling Burra Bazar. Get to the Canning Street Portuguese Church and cross across to walk into the lane on the opposite side. 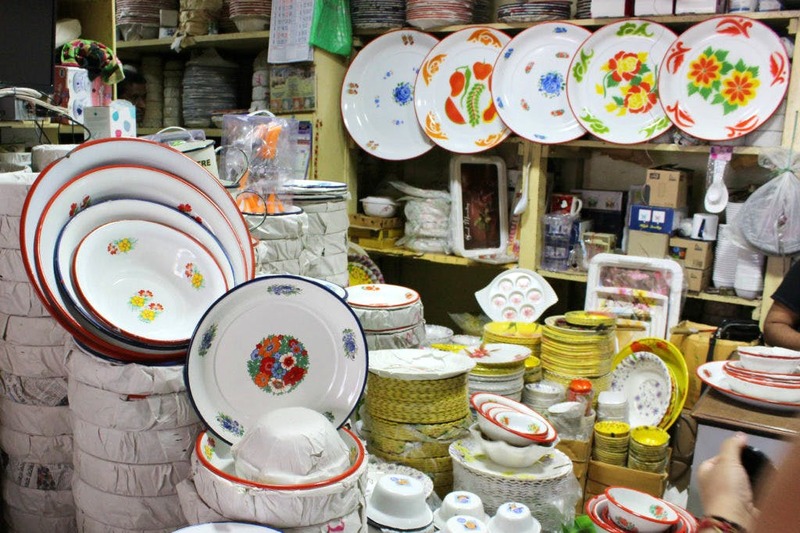 Once there, you’ll find a stretch of stores and wholesale stalls selling hand-painted colourful tamchini crockery. From paisley to floral-pattern bands, these come in different colours and sizes. But best of all, they are all priced as reasonably as INR 40 onwards. Our Muslim friends often use big tamchini plates for their shared Iftaar meals. So, if you visit the market during Eid, you'll definitely find a a lot many options and a large stock. Along with the paisleys and florals, you’ll also find tamchini with plenty Islamic designs. Oh, and before you visit remember to keep Sundays out because the stores are open from Monday to Saturday.